A rare opportunity to buy a unique David Moss design and build canoe-yawl. Gaff rigged with steel centre-plate and lead ballast keel. Construction is strip planked columbian pine on an iroko backbone, painted decks and spruce spars. Her engine is a 10hp Yanmar with hydraulic drive running a Featherstream 3-blade prop. She has three berths, Taylors cooker and a chart table with depth sounder and log. She also has beaching legs. She is in excellent condition and ready to sail, at present in the shed. 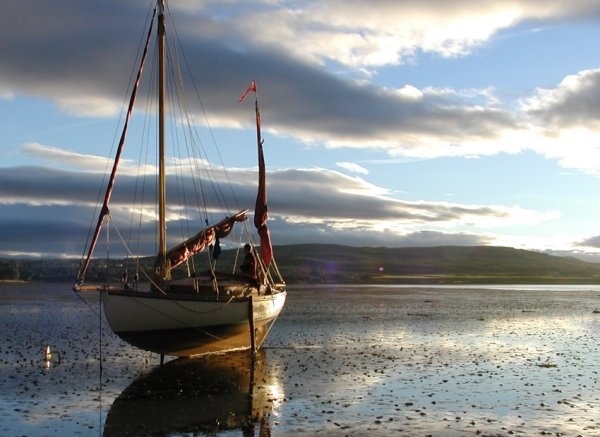 Her owner has cruised her up the west coast of Scotland and over to the Moray Firth, down to Falmouth and Portsmouth. 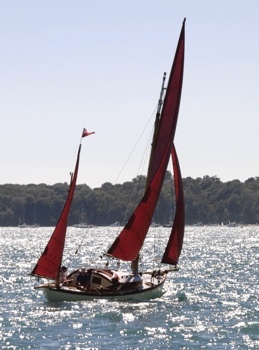 She has sailed to Northern France and the Channel Islands and has proved to be a fast and able sea-boat. Owner moving to a new and much larger David Moss designed pilot cutter. Contact David or visit the yard for more information. Email for more photos.